Far-right group Britain First was kicked off Facebook last week. It forgot to update its website accordingly. Now Britain First links to a pro-diversity page. Facebook kicked far-right political group Britain First off its platform last week, meaning the group’s official pages were all deleted. That affected three pages belonging to Britain First as an organisation and its two leaders Jayda Fransen and Paul Golding. Fransen still has her own account and both are still posting photos to Facebook-owned Instagram. But since both Golding and Fransen are currently in prison for hate crimes, it doesn’t seem like anyone has had the time to update the social media section on Britain First’s website. 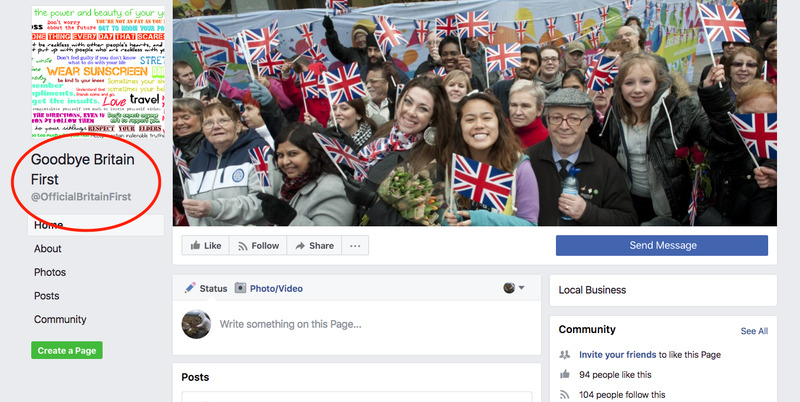 It then links to the “Official Britain First” Facebook page – which has now been hijacked by someone who clearly is not a fan of Britain First. Now renamed “Goodbye Britain First”, the page shows a diverse crowd of people waving the Union Jack flag. Britain First is best known for hate crimes against Muslims, stirring up anti-Muslim sentiment, and for complaining about mosques. It has been described by Prime Minister Theresa May as “hateful” and is designated a hate group by research organisation Hope Not Hate. The group briefly hit headlines when Jayda Fransen was retweeted by US president Donald Trump, who subsequently apologised – sort of. Facebook’s ban last week followed Twitter booting the organisation from its platform, and YouTube restricting some Britain First videos. Business Insider contacted the hijacker for comment, who only pointed out that they had not taken over Britain First’s original page but simply taken the username. “The Britain First page was deleted, which left the username free. I merely claimed the username,” the person told us.